ASUS is reportedly working on a new version of its Radeon HD 7950 DirecTCU II that features a more compact cooler and PCB, with denser aluminium fin stacks, six copper heatpipes (instead of five), and a new display output layout (2x DVI DL, 1x HDMI and 1x DisplayPort vs 1x DVI, 1x HDMI, and 2x Mini-DisplayPort on the original. The new design could be implemented on both the standard and TOP models. The standard model ships with clock speeds of 800 MHz core, while the TOP model ships with 900 MHz core clock speed. 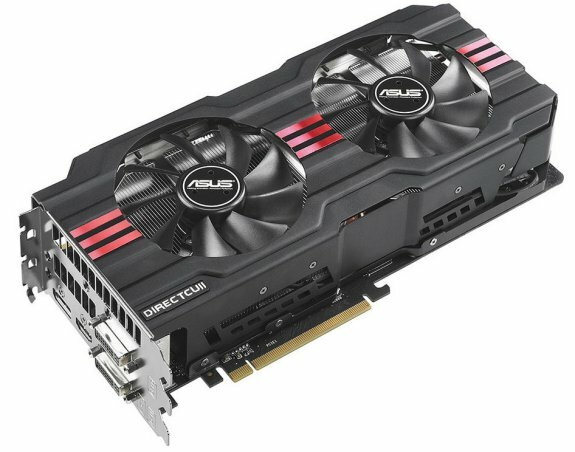 While it's not expected that the new cards will be cheaper than the current HD 7950 DirectCU II cards (at least not significantly), they could let ASUS brace itself for industry-wide price-cuts of the HD 7950, if and when they come about.